"When You Want the Only One"
NEW!Now you can order anything you see here on 8" tile! These are commercially made, nice flat tabless tiles, for murals or singles! Need it in less than 2 weeks? Click here. 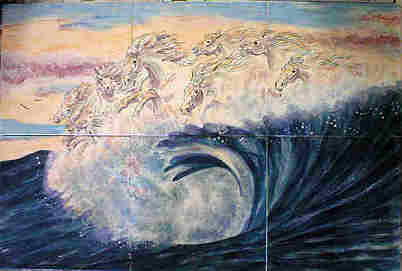 Welcome to my world of unlimited possibilities for creating exciting and colorful ceramic art tile murals. 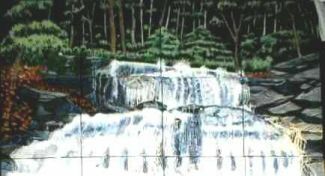 I have kitchen and bathroom tile backsplashes and murals, single accent tiles hand-painted on your tiles or my blanks, fireplace surrounds in mural form or accents, even stair risers with commercial or hand-made ceramic tiles. I also create 3-D wall sculpture, made-to-order or pressed into molds. All my work is one-of-a-kind and fully guaranteed. The following links lead you to many previous commissions, but the sky is the limit! Click here to pay with credit cards or cash! as framed or unframed Giclee fine art prints! Fantasy A mural of 3-6" tiles of a Chinese dragon. 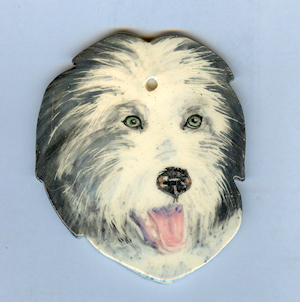 This website and artwork was created and is solely owned by Dy Witt, a woman ceramist. Click here to see info on my ebook about Dog Training! Having *your own ebook* is a valuable (and effective) marketing tool for nearly any business owner who wants to increase their profits. This incredible ebook explains things nobody else has ever published before! 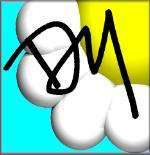 This ebook explains the real way to make real money online with ebooks... Finally! Somebody gives people the truth about what it takes to make massive amounts of money with your own ebook... whether you wrote it or not!